There are few things more thrilling to young children than making homemade instruments and then playing them in a family orchestra. Virtually anything that can be hit, plucked, shaken, or blown can be turned into an instrument. There are too many articles and books written on musical instrument toys for this to be a comprehensive list, so I'm not going to even try and instead give you a few ideas to get you started. Claves, or rhythm sticks, can be made with virtually any kind of stick that can be banged on each other. We have actually purchased a couple of sets, and they are my children's favorite. 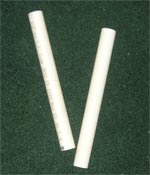 The claves pictured here are made of PVC pipe. They have used craft sticks, pieces of dowel, and kitchen utensils for this purpose as well. This one is my favorite. You will notice in the video that the glasses that have more water in them seem to resonate less. Goblets work best tuning purposes, and you have the added benefit of rubbing your fingers over the rim for a singing timbre. If you color the water, you may want to have a separate water bowl to moisten your fingers with. I colored the water to make it more attractive to my toddlers. The colors I chose were red, yellow, blue, orange, green, and purple. I chose these colors for their contrast, but any color combination would work. These rain sticks were made with paper towel rolls, wheat, packaging tape, and blue paper. I traced the bottom of the paper towel roll on a blue index card, folded the paper in half, and cut it out. Then I placed clear packaging tape over the circle and placed the circle over the paper towel end. I put paper in between the tape and the open space inside the roll because I didn't want the wheat to stick to the tape. Then I poured wheat into the pipe and repeated the process on the other side. You can be done here, or you can have the kids decorate an 11" by 6" piece of paper and tape it to the paper towel roll (pictured on the right). Alternatively, you can have them decorate the paper towel roll with stickers. This part is optional, but my little boy loved it. 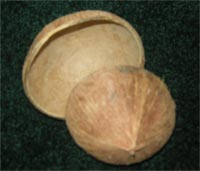 Reminiscent of Monty Python and the Holy Grail, the coconut halves resemble the sound of a horse's gallop. To make ours, my husband drilled two holes in opposite sides of a coconut and drained the milk out. Then he used a saw and cut around the edges. He said that he only used the saw for the hard outer shell, and when he was done he hit the coconut on the cabinet and it broke cleanly. One of these days I may sand them, but I haven't gotten around to it yet. In Kids Make Music! Clapping & Tapping from Bach to Rock! , they suggest that you can buy a large balloon, cut off the mouth piece, and stretch it over a coconut half to make a bongo drum. We have a set of metal mixing bowels in our kitchen and they make wonderful percussion instruments. Adding water is fun because the pitches change as the water level is changes, or the water is moved while the bowl vibrates. Try hitting the bowls with different kitchen utensils to see what kind of sounds they make. Does it sound better with a wooden spatula or a metal one? What about plastic? Does the size of the utensil matter? What happens when you tap on different parts of the bowl? Do you like the sound if you hit the bowl from under the water? Can you see the water vibrate when you hit the bowl? There are many extension activities you can do with metal pots and pans. This is the classic homemade instrument toy, and it can be made in a variety of different ways. I had a great sound when I used a smaller shoe box, but there were strong objections from my son so I used aluminum cans instead. I only recommend using cans if you have a can opener that will cut the can open smoothly, safety first! The important thing to have when you make stringed instruments is a sound box, strings, and a bridge of sorts so that the strings can vibrate freely. All of this is accomplished with a can and rubber bands. In the video I used two different sizes to show the contrasting sounds. Making homemade instruments is a fun activity for craft time, music time, and even science. Here is a video of all of these instruments to give you an idea of the sounds you might get if you make these instruments yourself. Enjoy! For more ideas, see the homemade instruments on this site.